Are Credit Unions Robbing Us?Eliminate The Muda! 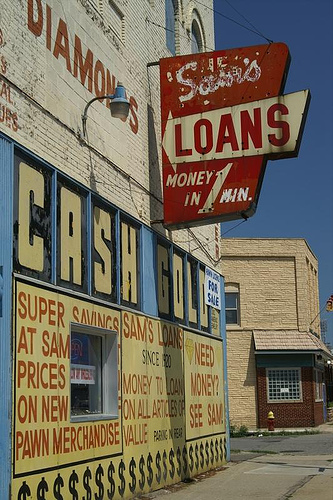 The infamous PayDay loans are topic of many conversations and debates. Suffice it to say that you should avoid them at all cost because if you have ever found yourself using one of these services you have likely paid the highest premiums to address your short term need. Using the PayDay Loan Calculator provided by the Consumer Federation of America you will learn that these short term loans will cost you from a low of 122% APR to a high of over 1000% based on a $300 loan. These companies usually quote the cost of their service in terms of fees per $100 borrowed. Get this straight, any type of borrowing is bad if you can prevent it. But where do you go if you do need to borrow some money? Conventional wisdom might suggest a local or national bank. Many would prefer a Credit Union due to their non-profit status and the perception that they often offer loans with lower fees and interest rates to their members. What you thought you know may be wrong. Once again we have a chance to learn caveat emtor, let the buyer beware! In yesterday’s USA Today Newspaper, Sandra Block wrote an article titled Some credit union loans no deal. In this article she describes how some credit unions have taken the PayDay loan models lead. They are charging outrageous fees for short term loans. In one example of a loan up to $700 the credit union was charging $70 for a 14 day loan. Have you been robbed by your credit union? I would question why this isn’t considered “Predatory Lending”? Sadly the definition of predatory lending appears to require fraud or deceptive practices. There may not be blackmail or threats of violence but these fees are relatively excessive. The simple message is to avoid short term borrowing at all costs. Do not use PayDay loans, do not use credit unions, do not use loan sharks.